Any woman who loves light and smooth skin is full of vitality. Today, with modern technology, cosmetic manufacturers have been able to purify the precious nutrients derived from nature to bring the best skin whitening benefits for women. In including the white skin EssenceLaneige White Plus Renew Original Essence EX . This is the famous product of Laneige and received many prestigious beauty awards around the world, highlighting the Global Beauty Award 2013. Pure white skin Laneige White Plus Renew Original Essence EX is the essence with outstanding effect as moisturizing and white skin. Laneige White Plus Renew Original Essence EX with extracts of white licorice helps to darken, deepen and whiten the skin from deep inside. - The product also contains green tea essence to help anti-bacterial, moisturizing and anti-oxidant, skin more smoothly healthy. Niacinamide also prevents the appearance of melanin, improves skin tone and dark spots, leaving you with a naturally colored, white complexion. 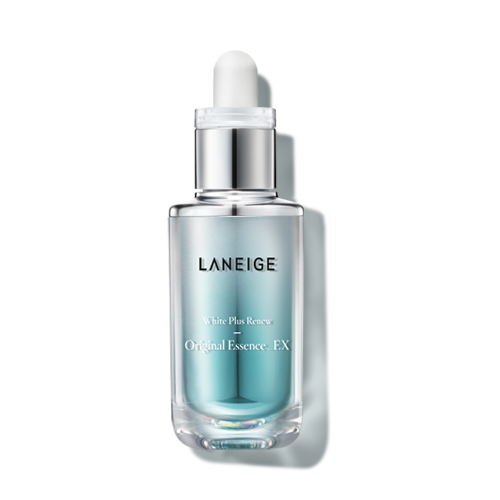 - And Laneige has successfully developed the Melacusher technology that accelerates the removal of melanin from the skin, leaving the skin free of brown spots, freckles and naturally nourishing. - In addition, the product also supports the improvement of skin moisturizer, the skin is not only white but also smooth moisture, full of vitality . 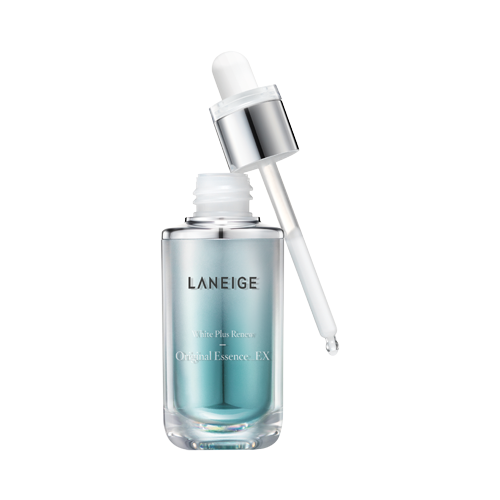 Laneige White Plus Renew Original Essence EX is a liquid milk formulation that can quickly penetrate into the skin and provide a comfortable, non-sticky feel. Laneige White Plus Renew Original Essence EX has a beautiful bottle design and elegance, bring a look of sympathy , fresh look when looking. It is suitable for normal and dry skin. * Note: The effect of the product is fast or slow depending on the location of each person. - Take a sufficient amount, dots on the cheeks, forehead, nose, chin and neck gently with hands to massage equally to the nutrients are absorbed deep and bring the best effect. Nitrile, Saururus Chinensis Extract, Shear Butter, Green Tea Extract, Yeast Extract, Stearyl Glycyrrhetinate, Hydrogenated Lecithin, Glyceryl Stearate, Cetearyl Alcohol, C14-22 Alcohol, Xanthan Gum, Hydroxyethyl Acrylate / Sodium Acryloyldimethyl Copolymer, Stearic Acid, C12-20 Alkyl Glucoside, Polyglyceryl-3 Methyl Glucose Distearate, PEG-100 Stearate, Carbomer, Tromethamine, Disodium EDTA, Ethylhexyglycerin, Phenoxyethanol, Flavoring .